With these words, one of popular music’s most recognisable and celebrated names of the past 40 years – Agnetha Fältskog – signals her return to the spotlight. The siren songstress from ABBA is coming back with a new album “A”, due for release in May and preceded by a curtain-raising track, “When You Really Loved Someone,” which is available internationally as a single to buy from TODAY, Monday March 11. 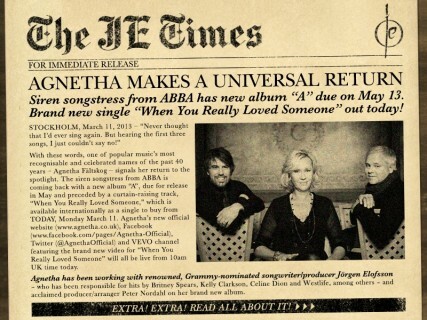 Agnetha’s new official website, Facebook, Twitter (@AgnethaOfficial) and VEVO channel featuring the brand new video for “When You Really Loved Someone” will all be live from 10am UK time today. Agnetha has been working with renowned, Grammy-nominated songwriter/producer Jörgen Elofsson – who has been responsible for hits by Britney Spears, Kelly Clarkson, Celine Dion and Westlife, among others – and acclaimed producer/arranger Peter Nordahl on her brand new album.